AsciiLife is a new iPhone app brought to you by the developers at Neomobili. 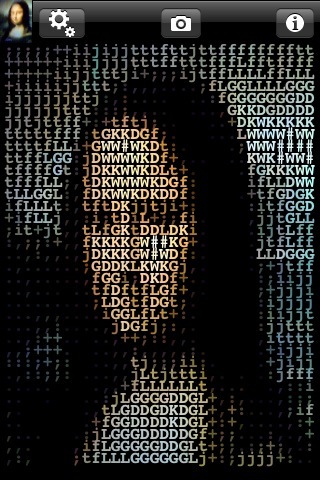 This app is designed to make any image you view through your iPhone camera ASCII art-like. For those of you who don’t know, ASCII art is when tiny images are put together to make a larger image. The final product is a little like a Seurat painting (think about the painting in Ferris Bueller’s Day Off). AsciiLife allows iPhone users to create art simply by pointing and shooting. While this app is open, on your main screen is the image in ASCII art, and you can see the actual image in the upper left hand corner. To take a picture, touch the camera icon. You have the option of sending your art to your Facebook or twitter account, or you can save the image to your photo library. You can choose from four different filters to use from the toolbox: the matrix-like green and black, full color, black and white, and black and red. It’s easy to make your way through the app, there are two buttons used to take pictures and one information button. This app is a cool idea, you can view virtually everything around you in ASCII art, in real-time. But, a few things could use some improvements. Firstly, the characters could be a bit smaller, allowing more of them to make up an image. These characters serve as pixels, the more of them, the clearer; the less of them, the less legible the image is. Because the characters and symbols are on the larger side, it produces an unclear image. Also, most of the letters and symbols replace light or dark spots to compose the image, so the lighter the environment the better. Be prepared to continuously look for better lighting and avoid shadows since the iPhone doesn’t have a flash. The functions in the app are limited; it is designed only to take pictures and nothing else. I think that’s one of the biggest problems with AsciiLife. I spent about 5 minutes tops playing with this photo app. If the developers could add some more stuff for us to play with, it could really make the app more exciting. AppSafari review of AsciiLife was written by Amanda McFarland on April 6th, 2010 and categorized under App Store, Fun, Photos. Page viewed 3922 times, 1 so far today. Need help on using these apps? Please read the Help Page.